A day in the life of my little sister. 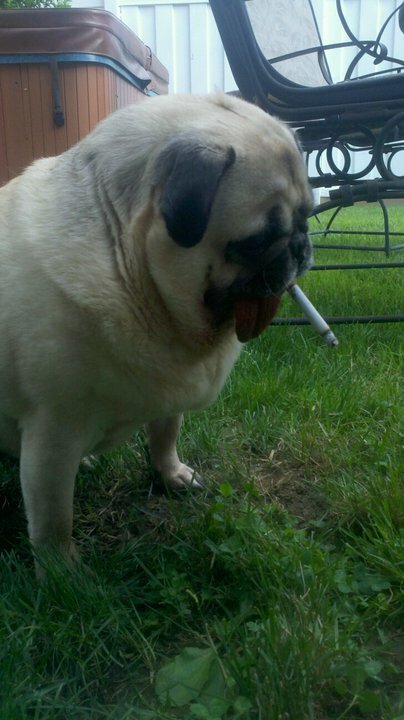 The pug is named Ethel and she is obsessed with cigarettes. She steals them from your hand or the ashtray and smokes them, or eats them if they’re unlit. She wasn’t forced, in fact my sister has to remove all cigarette butts from the entire property to keep her from devouring them. The cigarette she is smoking here was stolen from me while I was smoking it. Also, that’s her tattoo I did for her, (my sister, not the smoking dog) of a sparrow and some honeysuckle.